To get your bed bug control going, it is important to understand what are the signs of bed bug and how to identify them. They hide very well, so start by looking for their dropping. This can give you a clear indication of the infestation level that you are facing. Some of the droppings will be clustered together. It is safe to say those areas with the clustered dropping are their harbourage areas. They feed on human and will need to take time to travel to get to the next blood meal. They will choose to harbour near human. It is not uncommon for us to not feel anything during the bed bug bites as they are capable of injecting saliva that acts as an anaesthetic. This numb the area that they are feeding on. So instead of waiting for them to bite you, look for them instead! Where to look for Bed bug harbourage? There are plenty of off-the-shelves pesticides for bed bug removal. Though this might kill any live presence, it can hardly solve your bed bug problem. The target is to stop them from multiplying. Finding the bed bug eggs is key to eliminate bed bugs infestation. Their eggs are well-concealed. They will find cracks and crevices to safely hide them. This can be a challenging task for you. Hiring a pest management professionals like us would still represent a smarter move. Not only is our job to kill bed bug but to ensure that you won’t have a reinfestation again. This will not only give you peace of mind but a good night sleep as well! First step: Placed all your clothes that you suspect that is infested in a plastic bag. Seal the bag. Include all pillowcases, blankets, bed sheet. Wash them in hot water of 60 Celsius. Second step: Separate the mattress from the bed frame. Sun the mattress for 2-3 hours together with the pillow. Third step: Turn the bed frame upside down and look for dropping or eggs. Remove the eggs. Try to keep your home free from unwanted boxes or even furniture. When returning from an overseas trip, make sure to inspect luggage and clothes. Our bed bug service has two different treatment methods. One with chemical and the other without. Both are equally effective and will be able to eradicate the infestation. Depending on the infestation level, you might need two to three sessions to completely eradicate them. Each session must be done within 7-10 days apart to break the egg cycle. We always start off with a thorough inspection. This is to understand where the main harbouring areas are and to familiarise ourselves with your premise. A good 30 minutes inspection is key to control bed bug. During the inspection, we will separate the mattress, bed frames and any types of furniture in the house. This is to ensure that we will be able to check on all the areas and look for any signs. Bed bug hides very well, so looking for their dropping is key in finding their harbouring area. Check out the video below to understand better about the inspection. Why is Bed bug Misting treatment effective? One mistake that most pest control technicians make is to not follow the dosage for the chemical. More is not always good. They are known to build resistant over time. So by not using the correct dosage, they are able to get “stronger” should they survive the first treatment. This will allow their offspring to be harder to kill and they are able to multiply faster than usual. 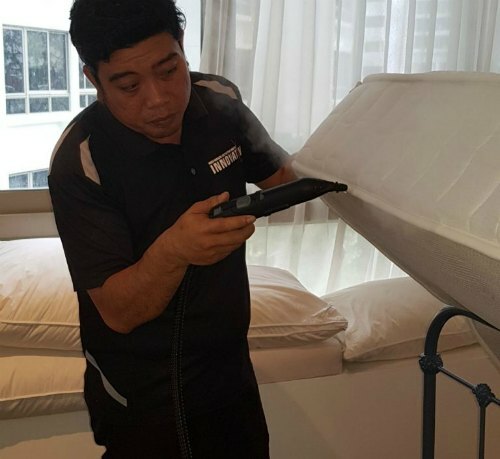 Not all pest control companies are equipped with the right technique and experience to counter the bed bug problem. Check out our bed bug chemical preparation below. 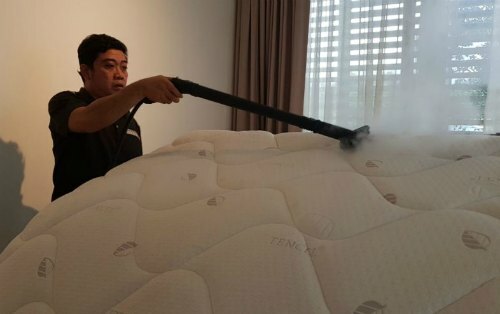 Bed bug Misting treatment is a residual spraying treatment that enables a wide coverage of surface areas. When this happens, they will be affected once they start moving to the sprayed surfaces. Read more in our 4 steps ro get rid of bed bug. Procedure 3: Understanding the difference between drenching and misting. Procedure 4: Using a ULV misting that enable fine droplet of chemical to be on the surface of the harbouring areas and potential harbouring areas. 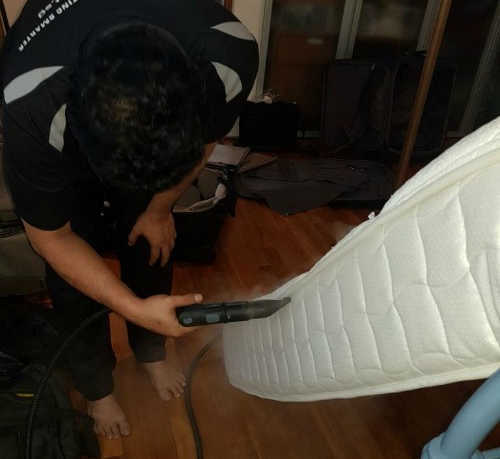 Once the water-based chemical dried up, it will leave a residual effect which will ensure that the bed bug will be in touch with when they move around. Another popular method is by steaming. The steamer carries heat to the affected areas and thus killing the eggs and any live presence. This process is eco-friendly as there isn’t any chemical involved. However, it will take a longer time to thoroughly complete the bed bug treatment.